STEM Inspirations Poster Contest Kickoff! This year’s category is “STEM Inspirations” – Posters should depict careers that use science, technology, engineering and math concepts to recognize, prevent, and solve problems in society. Content can be on any STEM degree or field. Posters should be fun, motivational and inspire students to pursue a degree in STEM (Science, Technology, Engineering and Math). Women increased their representation at the bachelor’s-degree level for the fourth straight year, earning 18.9 percent of degrees awarded in 2012, up from 17.8 percent in 2009. Women’s enrollment in bachelor’s degree programs has also increased slightly over the past few years, from 18.1 percent in 2010 to 18.9 percent in 2012. Based on enrollment trends, we expect to see the percentage of women receiving an engineering bachelor’s degree to increase slightly over the next few years. 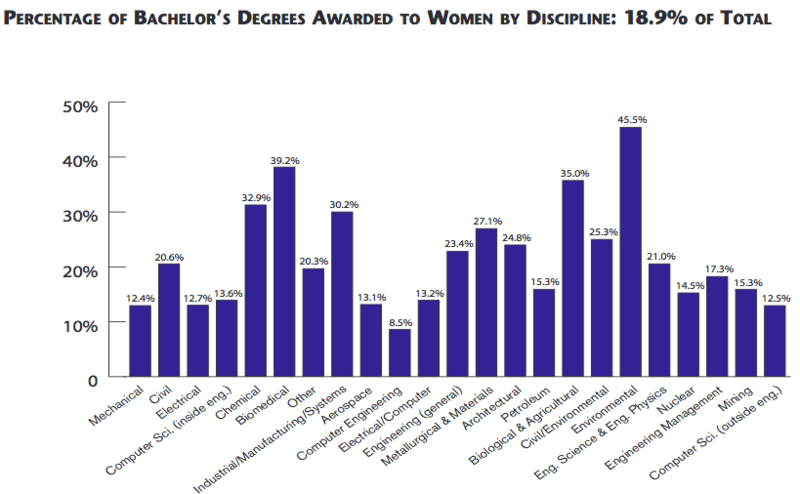 The percentage of engineering master’s degrees going to women reached a 10-year high of 23.1. Over the past decade, however, that percentage has been relatively stable, dipping only to a low of 21.9 in 2004. The percentage of doctoral degrees awarded to women rose slightly over 2011 to 22.2, and represents an increase of almost 5 percent since 2003. Based on enrollment trends, we expect the percent of doctoral degrees awarded to women to remain about the same over the next few years.